The image below shows a gaunt Anthony Burgess, prior to A Clockwork Orange, and far from the cigar-smoking man of letters whose image regularly appeared in the press of the seventies and eighties. Unlike the tourist Burgess, Ronald Beard has lost his spouse, and Rome is transformed into a land of the dead; a city of rain and ghostly reflections. The city in Beard’s Roman Women is quite unlike the one in the picture postcard, it is a mythical Rome, a spectral place. Anthony Burgess revisited Rome over the course of his life: as a tourist, as a resident, for literary talks and to film a documentary, and his protagonists – F. X. Enderby and Kenneth Toomey, for example – also visit the city. 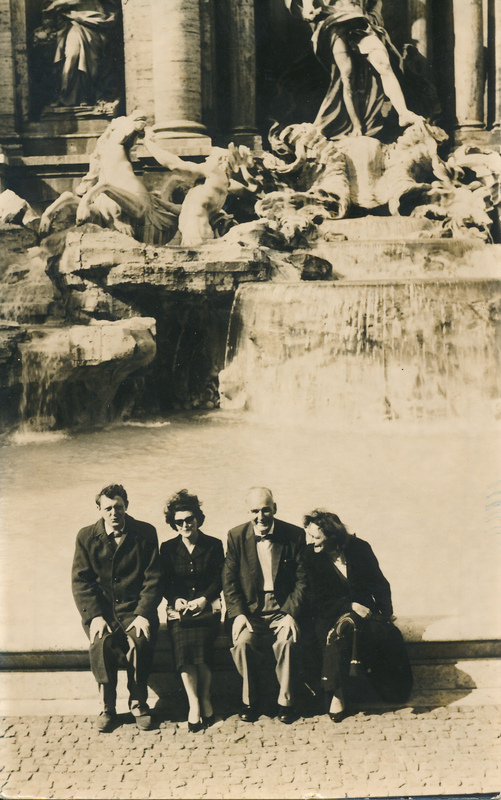 Though Burgess’s experiences of Rome are undoubtedly various, we have perhaps captured Burgess’s initial impressions of the city, preserved in this 1959 image.